New research from Roy Morgan shows that nearly 5.6 million Australians, or 27.4% of Australians aged 14+, shop at coffee/doughnut stores in an average four weeks. Despite not featuring in the top five stores for customer satisfaction, McCafé is the most visited coffee/doughnut store with nearly 2.3 million visitors in an average four weeks. Muffin Break – visited by over 940,000 Australians. An analysis of the demographic profile of Australia’s leading coffee/doughnut stores shows that women are more likely to visit such stores across the board, compared to men, but that there are significant differences between the age profiles of the different stores. Stores including McCafé, Gloria Jean’s, Donut King and Starbucks tend to appeal more to younger generations including Millennials and Generation Z – those Australians aged under 40, while Coffee Club, Michel’s Patisserie and Muffin Break appeal more to older Australians such as Baby Boomers, who are primarily aged in their 60s. Michele Levine, CEO, Roy Morgan, says Donut King has performed well in 2018 with a consistently high level of customer satisfaction putting the Retail Food Group brand on track to win its first Roy Morgan Annual Customer Satisfaction Award since 2015: “Retail Food Group (RFG) franchisee Donut King has built on victories earlier in the year by winning the monthly Roy Morgan coffee/doughnut store customer satisfaction award in September with a customer satisfaction rating of 89% (up 3% on a year ago) ahead of stablemate Michel’s Patisserie up 6% to 86%”. Reigning 2016-2017 Annual Coffee/Doughnut Store Customer Satisfaction Award winner Muffin Break has come in third in September with 84% and faces an uphill battle to repeat last year’s success with only three months to go in the year, she says. Although the McDonald’s-connected McCafé wasn’t able to crack the top five for customer satisfaction in September, the chain continues to be the most visited coffee/doughnut store in Australia, with over 2.3 million visitors in an average four weeks. “The success of McCafé is built off the huge number of visitors to McDonald’s. Over 10.6 million Australians (52.7%) buy from McDonald’s in an average of six months – which we covered in detail earlier this year with our analysis of Australia’s leading fast food outlets. Analyzing Australia’s leading standalone coffee/doughnut stores shows that Donut King, Coffee Club and Gloria Jean’s are all visited by over 1 million Australians in an average four weeks with Muffin Break close behind, visited by over 940,000 Australians. To understand the customer profiles of Australia’s leading coffee/doughnut stores Roy Morgan’s deep data and analytics enable companies to analyze and understand their customers in great detail,” Levin added. Roy Morgan’s Helix Personas consumer segmentation combines sophisticated psychographic and behavioral analysis to classify the Australian population into 56 Personas and seven communities and is a critical tool used to identify and understand existing customers and, even more importantly, to target potential new customers. 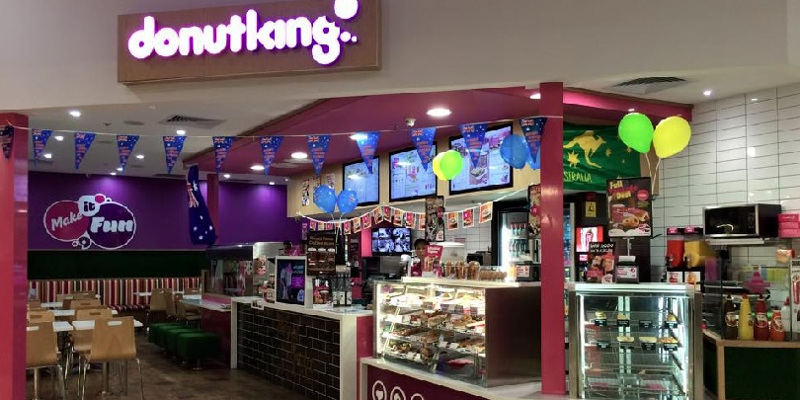 Australia’s Donut King won Customer Satisfaction award for September, in the coffee/doughnut stores category, with a customer satisfaction rating of 89%, according to the research company Roy Morgan. Donut King and Michel’s Patisserie were the only two of the top five coffee/doughnut stores in September to improve their customer satisfaction ratings compared to a year ago and both are owned by leading Australian retailer the Retail Food Group (RFG). Donut King was up 3% to 89% and Michel’s Patisserie up 6% to 86% with both RFG brands overtaking defending Roy Morgan Customer Satisfaction Annual Award winner Muffin Break on 84%, down 3% from a year ago. Another RFG coffee store, Gloria Jean’s, missed out on the top five. Filling out the top five were Starbucks Coffee with a customer satisfaction rating of 82% and Coffee Club on 80% in September with both unchanged on a year ago.